S hooting is worth £2 billion a year (Gross Value Added*) to the UK economy and provides significant conservation benefits according to the results of independent research released today by leading shooting and countryside organisations. Henry Robinson, president of the CLA, said: “The figures in this comprehensive, independent report are striking. Worth around £2 billion to UK businesses and supporting the equivalent of 74,000 jobs, it is clear that shooting adds a vital stimulus to the rural economy. Many rural businesses found the trading environment challenging as a result of the 2008 financial crisis - shooting provides a shining example of how resilient the rural economy can be. More than that, shooting providers spend nearly £250 million on protecting the landscape and are integral in ensuring the most effective management of the land." Nick Fellows, chief executive of the Clay Pigeon Shooting Association (CPSA), said: "It is great to see the value of our wider industry identified so comprehensively in this new report. We know that target shooting sports are increasing in popularity all the time, particularly clay shooting, and this is a reflection of our recent Olympic success and the greater visibility of our sport at a local level. With the broad club base and new initiatives to encourage and support young talent, it is a sport that embraces all ages and abilities and it is really encouraging to see it in the wider context of a thriving and valuable industry." Amanda Anderson, director of the Moorland Association (MA), said: "This thorough report tells us that environmental work undertaken by shooting people covers more than ten times the total area of all national and local nature reserves. The largest type of land by far over which beneficial management takes place is heather moorland managed for grouse accounting for a significant proportion of the 3.9 million conservation work days. Grouse shooting is a major contributor to the health of our countryside." Lindsay Waddell, chairman of the National Gamekeepers' Organisation (NGO), said: "This detailed report demonstrates gamekeepers deliver truly effective wildlife conservation across the uplands and the lowlands on a scale that the managers of most nature reserves can only dream about. It is clear gamekeeping safeguards a lot of jobs in the countryside and helps keep the rural economy alive, especially so in remote areas." Andrew Mercer, chief executive of the National Rifle Association (NRA), said: "This report confirms what the shooting community has long understood - that shooting is a major sport of national importance both in terms of the number of regular participants and economic worth to the UK. The rich diversity of shooting often means we operate in small groups, unnoticed and quietly enjoying our sport responsibly and with passion. Together shooting sports are a force for good; we are law abiding, strictly regulated, safety conscious, enthusiastic environmentalists, whose passion for shooting can literally last a lifetime. "Support for target shooting is growing rapidly; from grass roots to international competitions such as the Commonwealth Games. Shooting can genuinely claim to be a sport for all ages, sexes, budgets, and any physical ability." British Association for Shooting and Conservation (BASC) - 01244 573052 or 07500 609161. *Gross Value Added (GVA): The standard monetary measure of the value of economic activity. Equal to the sum of employment costs plus profits. Equivalent to the value of goods and services produced minus the inputs (raw materials, services etc) required to produce them. 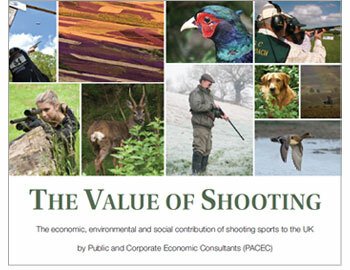 The Value of Shooting research examined the employment and monetary flows of shooting providers and participants to quantify the direct and indirect contribution of shooting to the UK. It measured the environmental effects of conservation and land management practices and looked at the social aspects of shooting. The data collected was based on a 12 month period between August 2012 and July 2013. The research included 16,234 survey responses.